Problem Statement: Design a solution for individuals to clip their fingernails or toenails with precision. 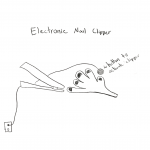 This idea is an electronic nail clipper. You clip one of your nails by pressing a button using different finger of same hand. There are built in safety features to prevent injury. 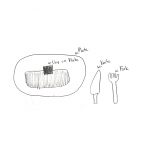 Problem Statement: Design a product that allows an individual to cut steak or other proteins. This is a plate with a build in clip. Once meat is placed onto the plate, you clip it down. After, you take your knife to cut the meat into pieces. Swap out the knife for a fork and eat away! 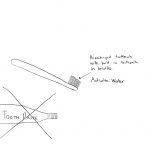 Problem Statement: Design a product that allows individuals to brush their teeth without squeezing out toothpaste. This device is a prepackaged toothbrush with built-in dry tooth paste. The toothpaste will be activated by placing the toothbrush under water. They can be reused as a normal toothbrush after.